Who was he? 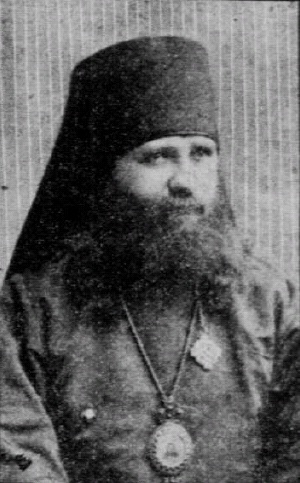 Head of the Russian Archdiocese in North America at the turn of the 20th century, and later Patriarch of Moscow during the Bolshevik Revolution and its bloody aftermath. He was known for being a kind bishop, humble and unassuming. He suffered under the Bolsheviks and was glorified as a saint in 1988. Something he’s famous for: In 1905, he wrote a reply to a survey the Russian Church had sent to each of its bishops. Part of that reply included a sort of blueprint for Orthodoxy in America. St. Tikhon envisioned a future where each Orthodox ethnic group in America had its own ethnic bishop, with overlapping jurisdictions, but with all the bishops sitting on a single local synod, led by the Russian Archbishop (and under the Russian Holy Synod). Wednesday night he retired early to his apartment at 1715 Powell street, where the cathedral is located. He was in such a condition of nervous prostration that Dr. Victor G. Vecki was summoned to attend him. He administered sedatives and left his patient apparently resting easily. But the knowledge that Tina de Spada would depart in the morning and that probably he would never see her again gripped his heart until it ceased its beating. When the family went to awake him in the morning he was dead. – From his homily on the Sunday of Orthodoxy in 1903, published in the English-language supplement to the Vestinik, 2/23/1903. September 17, 1905 (Sunday) Archbishop Tikhon consecrated the Holy Trinity church located in Winnipeg (643 Manitoba Ave / McKenzie St). – «Holy Trinity Sobor on Manitoba Avenue was the first Orthodox church constructed in Winnipeg. In 1904, it was consecrated by Saint (Bishop) Tikhon, the future Patriarch of Moscow» [Klysh, Myrone R. Orthodox Christians in Manitoba. A brief overview // The Canadian Journal of Orthodox Christianity, 2008, vol. III, № 3, p. 63]. – «The history of our Cathedral is very interesting. The church was blessed in 1905 by St. Tikhon, Patriarch of Moscow and all Russia, enlightener of all America» [http://www.holytrinitysobor.ca/?q=en]. – «The present temple was constructed in 1904, and consecrated by Bishop Tikhon (later Saint Patriarch Tikhon of Moscow) in 1905» [http://oca.org/parishes/oca-ca-winhts]. Christ is risen! From a new visitor to your site – wow! What a great resource for the historically minded. I am hoping you can answer a question. Did St. Alexander Hotovitsky, to your knowledge, ever visit or work in Alaska? I live in Alaska, and have only recently learned of this wonderful saint. Thank you so much for any help you can give me in finding the answer to this question. 1) From 1896 till 1914 Alexander Hotovitsky was the editor of the Russian Orthodox American Messenger, – titanic work for the lone hero! So Fr. Alexander never did work in Alaska. 2) Absolutely clear that until 1907 he didn’t visit Alaska [cf. : Туркевич В.И. Из нашей жизни. Десятилетие священства Протоиерея А. Хотовицкого // Американский Православный Вестник, 1906, т. X, № 5, с. 81–96]. 3) My opinion: Alexander Hotovitsky never visited Alaska (but maybe I’m wrong). Thank you so much for replying with this info. I first became aware of St. Alexander when I visited a church founded by him in 1905, Holy Trinity in Springfield, VT. So besides editing the Messenger, he was also traveling and establishing churches. Titanic work indeed! God bless the work you are doing – keep it up! 3b) In summer of 1910 Archbishop Platon, Archpriest Alexander Hotovitzky and Hierodeacon Vsevolod Andronoff visited Alaska. Then Fr. Alexander published a number of his articles in the Russian Orthodox American Messenger under the general title «On States and Alaska. From road impressions of His Eminence satellite» [Хотовицкий А.А. По Штатам и Аляске. Из дорожных впечатлений спутника Его Высокопреосвященства // Американский Православный Вестник, 1910, vol. XIV, № 13 (July 14) – № 22 (November 28); 1911, vol. XV, № 5 (March 14) – № 9 (May 14), № 11 (June 14) – № 16 (August 28), № 23 (December 14) – № 24 (December 28)] with some photos [especially: 1910, vol. XIV, № 22 (November 28), p. 331 & 1911, vol. XV, № 16 (August 28), pp. 285, 288, 289]. I sincerely ask You to forgive me for making a mistake. I just now read your latest reply to my question – I thank you and of course forgive you!! This is exciting news! There is a collection of the Russian Orthodox Messengers in the University of Alaska library here in Anchorage. It would be so wonderful to find these articles there – but translation of them will be another matter. God willing, I can find help with this too. God bless you and the work you do!